Read about the results/race report , the route, and the start list. The Strade Bianche Donne boiled down to a sensational finale on wet roads. The closing climb in Siena proved to be decisive with Elisa Borgini besting Kasia Niewiadoma and Lizzie Deignan. Saturday, 4 March 2017 – Played out in the Tuscan hills, the Strade Bianche for women is a 127 kilometres race with roughly 30 kilometres on gravel roads. Some of the eight gravel sectors feature punchy climbs and the finish is at the end of a steep climb into the old city of Siena. The Strade Bianche is the first race in the 2017 women's World Tour. So small wonder a strong field is ready for a massive showdown. Title holder Lizzie Deignan goes head to head with Olympic Champion Anna van der Breggen, World Champion Amalie Dideriksen, Marianne Vos, and former winner Megan Guarnier. 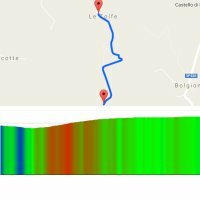 Cyclingstage.com brings you the startlist of Strade Bianche Donne.